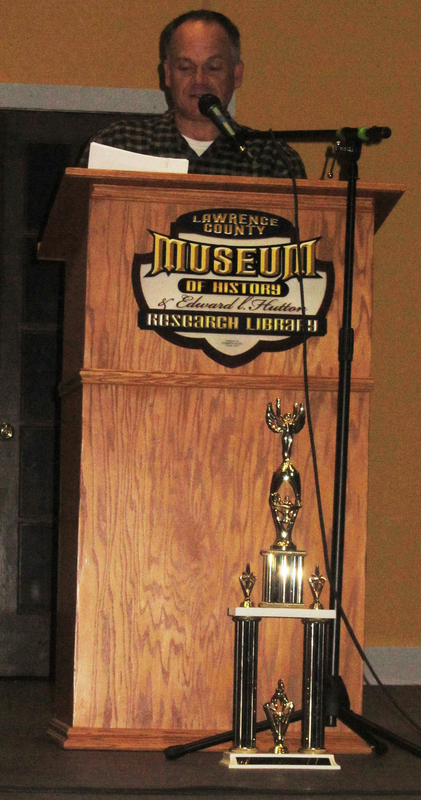 The annual competition is the major fundraising activity for the Lawrence County Museum of History. Bedford Laser Wash cleaned up Thursday night at Little Theatre of Bedford, defeating Sallee and Company, 120-60, in the championship game of Brain Games XII. Team members Dennis Martin (Capt), Dennis Whitaker, Joe Voris, Chelsea Jensen, Terry Tlustek, Dennis Massengil (alternate) —all are Bedford North Lawrence teachers, and they planned to wear the championship medals at school the next day. Bedford Laser Wash members, from left, Chelsea Jensen, Joe Voris, Dennis Whitaker, Terry Tlustek and Dennis Martin pose with the Brain Games XII trophy after winning the championship on Thursday, May 23. Photo by Marcey Burton, "Times Mail"
Thanks to the Little Theatre of Bedford for the use of this wonderful facility. Jeff Routh is checking in the participants. Among his many responsibilities at Brain Games, Larry King takes care of the audio. Joe Timbrook does an outstanding job as Master of Ceremonies. Jim Buher is facilitating the team members as they get their correct identification tags and prepare to compete onstage. Annette Seib and the Pynco 1 team prepare to go onstage. Pynco 1 team is on the left. Glenda Reynolds helps to write the questions and serves as one of the judges for the event. Keeping track of the scores. We would like to especially thank Pynco for donating the prize money to be awarded to the Brain Games XII champion and runner-up teams and the Little Theatre of Bedford for allowing us the use of their beautiful facilities. To all of our brave and wonderful Brain Games players, I would like to say, you are all winners to us! Thank you so much for your support of our Lawrence County Museum. Reba Butler, Janet King, Kenny White, Euretta Griggs, Greg Nikirk, Phil Mitchell, Jessie Day, Jeff Routh, Marge Phillips, Ray Lindsey and Jenny Purcell for their many contributions. Thank you all for another great Brain Games season! 2012: Ferguson-Lee Funeral Home "Ann Margret"
2010: Ferguson-Lee Funeral Home "Ann-Margret"
2008: Ferguson-Lee Funeral Home "Ann-Margret"
2007: Ferguson-Lee Funeral Home "Ann-Margret"
2006: GM Powertrain's "GM Powerbrain"
Click to return to the Fundraising Activities page.